SOOK JA RHO is known as the �flower painter� in Korea for her life-long dedication to painting flowers. 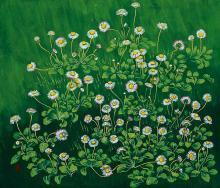 Her first UK show at Cat Hill Gallery in London features exquisite paintings of Korean wild flowers. These stunning works are painted in a pigment mixed with stone powder which catches the light and creates the most amazing illuminated colours.